ThinkPads come with an adapter that converts 100VAC-240VAC to 20VDC, but the ThinkPad travel adapter is $115. Additionally, I would like to be able to hardwire my supply instead of using a cigarette lighter adapter. 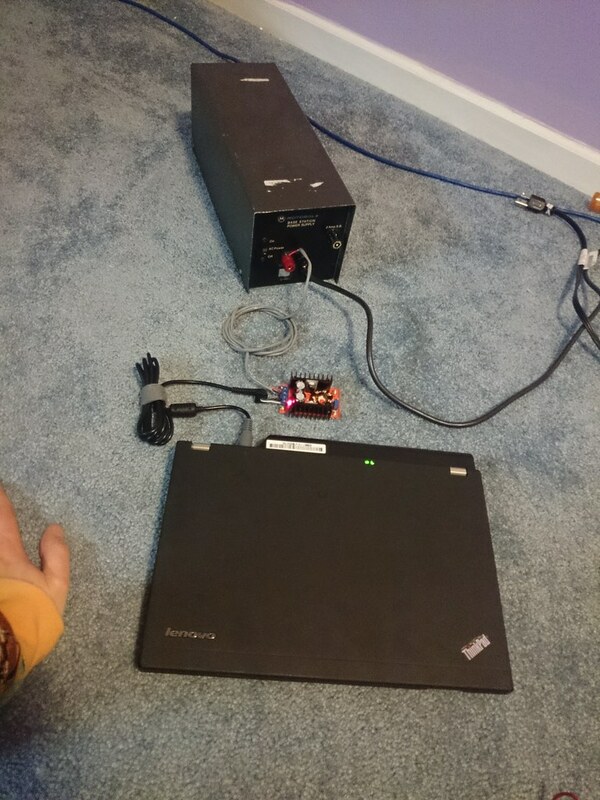 To charge a ThinkPad from a 12+/-3VDC, a converter is needed to generate the 20V required by the ThinkPad. Recently, mass produced modules from China have become available, so it is no longer necessary to design and build a PCB for most DCDC conversion applications. In my case, I can use a 150W DCDC converter kit, with some wiring to specify that the adapter can supply 90W. IBM/Lenovo uses a third pin located in the center of the barrel connector to indicate how much power can be supplied. This table can be found at ThinkWiki. This is much simpler than the Dell system. Connect Supply-Side(Cigarette Lighter Adapter or hardwiring). Attach a voltage meter to the output terminals of the converter. Energize the supply-side and note the voltage. Slowly turn the potentiometer until the output voltage is 20VDC. Make sure laptop is disconnected. Energize adapter with 12V supply. Measure 20VDC on inner shield to outer shield of ThinkPad connector. Measure 0VDC on center pin to outer shield of ThinkPad connector. My x220 only needs 65W. However, the 150W converter is a standard part, and smaller converters were not any smaller or cheaper. The converter could supply any of the 65W/90W/135W, however to save a little money, I ordered a two-pin power cable instead of a three-pin. With a two-pin, I was not sure if the signal pin would be grounded or open, but in my case it was open, so the supply registers as 90W. If 135W is required, use a three-pin power cable so that the signal pin can be grounded. If 170W is required, the next step up in converter modules is 600W. While listed as a 150W part, one of the transistors on mine is soldered in slopily, leading to poor heatsink contact. I plan to fix this, but until then I wouldn't expect the converter module to be able to hit the rated wattage. Also, DROK makes a slightly more expensived fused model.